Graphite Portrait Sketch - 8x10"
Well I was short on studio time today and even shorter on energy so rather than work from the mirror I grabbed a reference photo I had on hand to draw from. I plan on doing a painting from this photo after the workshop in November so I though it would also serve as a good study. I took a couple of measurements and dived in. Of course now I look at it and realize I should have measured more carefully after doing the initial block in as the face seems a touch too long. So I am leaving this sketch as ... 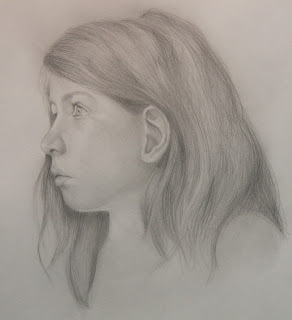 I could work on this for several hours just on the hair alone...so I had to pry myself away from the easel. Tracey, this is absolutely stunning! I've been lax in visting my favorite blogs as well, Tracey. Dang that Facebook but it's so much easier to comment on an artist's work on there.